Everybody Sing, Oh Yeah, It's a Critical Hit! Critical hits are among the most dramatic, and most popular, moments in a Starfinder game session. A player scoring a critical hit is generally rewarded with cheers from fellow players, while an NPC scoring one often leads to groans and (hopefully good-hearted) booing. A critical hit can change the course of a battle, force new tactics to be adopted, and may also set a foe on fire, leave them insensate for a round, or even chop off a limb. Critical hits are rare, but memorable. Now, groups can choose to make them MORE memorable. The Starfinder Critical Hit Deck offers hundreds of new critical hit results that can be used to boost the breadth and impact of that natural 20. Critical hits results are divided into three broad categories of attacks listed on every card (kinetic, energy, or spell), and one specific "Extreme Critical" on each card that can be selected if the attack meets it's narrower definition (such as fire damage, or melee attack). When an attack is a critical hit, you use the appropriate critical for your broad attack category, or if you attack matches the extreme critical you can choose to use that instead. A card's rules may give you an optional critical hit effect (one you can use in place of your attack's normal critical hit effect, if any), or a bonus effect (which you add to any critical hit effect you already have). These effects can add weapon special features, existing critical hit effects, extra damage, impose conditions on your foes, or grant bonuses to you or your allies. The rules card outlines how to determine the level of an effect, any required save DC, how to remove penalties that last until healed, and other details of applying the critical effects. For example, if you critically hit a foe with a thunderstrike pulse gauntlet, you might pull a card with the energy critical "Which Way is Up?" with the listed effect "Crit Effect: The target is flat-footed for 1d4 rounds (Fortitude negates)." You can then choose to use your pulse gauntlet's normal critical hit effect (knockdown), or the energy critical effect, giving you a chance to make the target flat-footed for 1d4 rounds. However, the same card with "Which Way is Up?" also gives the extreme critical "Extreme Sonic: Sound of victory." That critical says "Bonus Effect: Allies within 60 feet (not including yourself) regain Stamina Points equal to their level." Since a thunderstrike pulse gauntlet is a sonic weapon, you can choose the extreme sonic critical rather than the energy critical, and since that's a bonus effect, you can both knock down foes and inspire your allies so much they regain Stamina Points. So grab a deck, get an enemy in your sights, and hope you roll a 20! And I LOVE the illustration of the Critamander! And now we need a Critamander plushie. Yes, Plushie with special starfinder blue d20! 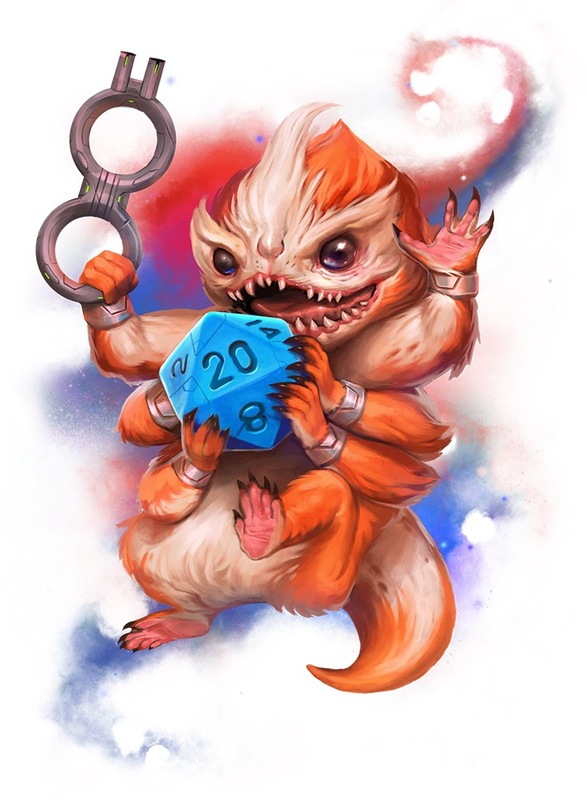 Only 1 in 20 Crittermanders is also a Critamander. You used to have to confirm that, but now it's easier to know. Does this come with songs that I can sing? If not, I'm sure you'll come up with some. Just got my deck. Very fun addition. I can't wait to use it in our next session! Is this a No More Kings reference? please tell me this is a No More Kings reference? My main man did double damage with it.